All dog owners have been in a situation where their precious pup needs a quick cleanup. Whether you're dealing with filthy paws after a trip to the park or food residue after a hearty meal, it's not always easy to give dogs a bath. Bathing takes time. If you have a long-haired breed, the process can take several hours from bath to brush. So what's the alternative? Baby wipes are quick, easy, and relatively cheap. Dog wipes do exist, but they tend to come with a much higher price tag. Does that mean you can use baby wipes on your dog? Are Baby Wipes Safe for Dogs? It may surprise you, but baby wipes are not safe for dogs. This is a huge misconception that many dog owners have, and it's not difficult to see why. Baby wipes are made with strict standards. They're formulated to be safe for the skin of a newborn with a vulnerable immune system, so why shouldn't it be safe for dogs? Truth is, baby wipes have a lot of things that just aren't safe for canines. They're filled with chemicals and synthetic fragrances. These types of ingredients, when used correctly, are perfectly fine for young human babies. However, when they're used on a dog, you may experience some very serious complications. It's important to remember that canines are completely different than us humans. While many dedicated dog owners let their pups experience all of the same things that humans do, they're still animals with unique needs. Their bodies are different than ours and will react to certain things differently. Think about all of the things that humans enjoy and dogs can't. They can't eat things like chocolate, onions, sugar substitutes, and much more. We handle those things just fine. Unfortunately, there are a lot of things that are fatal to dogs. Some of those things can be found in baby wipes. One of the most notorious ingredients in baby wipes is propylene glycol. Propylene glycol is an ingredient that's used in many cosmetic products because it helps with penetration and absorption. It's considered to be generally safe for humans, even in food products. However, it can be dangerous in large doses. 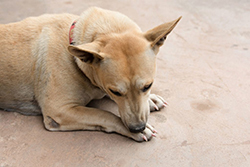 It has been known to be fatal in dogs, even when only a small amount was ingested. The thing that makes ingredients in baby wipes, such as propylene glycol, so dangerous for dogs is their behavioral habits. Dogs are constantly licking themselves. They do it to clean themselves up, to alleviate discomfort, or even when they're bored. If you were to use a baby wipe on your dog's fur, the various chemicals will stick. Unless you have a hairless dog, those ingredients aren't going to be absorbed into the skin. Even if some of it did, a significant amount will remain in the fur or on top of the skin. Eventually, your pup is going to lick that part of their body. In the process, they will ingest the various chemicals on the wipe. Because dogs are smaller and built differently than us, a tiny amount of something like propylene glycol can prove to be fatal. You'd have to rush your dog to an emergency vet for poison treatment. Can I Use Baby Wipes On My Puppy? As mentioned earlier, just because a product is safe for human babies doesn't mean that its safe for canines. If you have a young puppy, their risk for experiencing unwanted effects is even higher. Young puppies have a much weaker immune system and stomach. Their bodies just aren't ready to take care of foreign invaders. Not only that, but the small amounts of dangerous chemicals in a baby wipe will have a bigger effect on the small body of a puppy. Can I Use Baby Wipes On My Dog's Face? While a dog is less-inclined to lick their own face, it's still not recommended to use a baby wipe. They could easily rub their face and spread the dangerous chemicals to their eyes, nose, or mouth. Getting chemicals in the eye is just as dangerous as ingesting it. Can I Use Baby Wipes On My Dog's Bum? You should never use products that aren't approved for canines on your dog's bum. The skin around that area is incredibly sensitive. Your dog's bum is just the end of a very complicated system of organs. Using a baby wipe in this area may result in chemical absorption. Can I Use Baby Wipes On My Dog's Paws? The paws are the most common area where people mistakenly use baby wipes. Unfortunately, doing so results in a number of issues. In addition to the risk of accidental ingestion, your pup may suffer from allergic reactions. Baby wipes are formulated to complement the pH balance of young human babies. Your dog's skin is slightly more neutral than your own. Despite the rough texture on your furry friend's paws, their skin is quite sensitive. Exposure to dangerous chemicals and fragrances can lead to allergic contact dermatitis. Their skin will turn red and itchy. This can ultimately lead to bleeding, infection, and a host of other health issues. You should only use a dog-approved wipe on your pup's paws. Now that you know it's not safe to use baby wipes on your dog, let's go over some of the alternatives. You can easily find wipes that are specifically made for dogs. They may be a bit pricey, but you can rest easy knowing that your dog won't experience any side effects. These types of wipes are often natural. They're made of safe ingredients without fragrances, moisturizers, or harsh chemicals. You can also make your own dog wipes. Many seasoned dog owners choose to do this whenever they need a quick cleaning tool. Just get a standard cloth hand towel. Make sure that it's clean and free of any chemicals. Run it under some clean water to make it moist. Then, add a small drop of your favorite dog shampoo. Work the towel until the shampoo spreads. Just like that, and you have your very own DIY dig wipe. Of course, the best cleaning method available is a good, old-fashioned bath. Nothing beats the benefits of a full dog bath with a gentle cleanser. You can't rely on dog wipes forever. Your pup needs to be bathed regularly to stay healthy and happy. However, if you're in a pinch, a simple dog wipe will do the trick. Whatever you do, just don't use a baby wipe on your pooch. Also Read: Puppy Poop Color: What's Right & What's Not?